Knight of Pentacles (R) says when money, work and other important matters seem to be at a standstill – you need encouragement. Recognize now that “fear” is the powerful force that is causing you to hold onto the secure – no matter how unpleasant your situation is. It is time for you to begin to release the people in your life who are irresponsible. Recognize that their impatient attitude affects their progress. People who are timid and make a lot of mistakes, have received some hard knocks in their lifetime and they may be seeking the security of love. Dissatisfied with everything and everyone, they are looking for a new start. Your awareness will now awaken. Your mild personality has been taken to far, resulting in weakness and depression. You are repressing your desire for adventure and greater advancement and in so doing, the meaning has been taken away from your dedicated goals. Discouragement and depression have overcome you because you are identifying yourself with your functions. Focus on the magic – seek to discover the real source of your strength. Who is stable and reliably there for you? Who is committed to security and conventions? How is it going at work or on a project? What needs of your body or Mother Earth are you sensitive to? In the first position: The main difficulty for knights comes during their youth, when they need to learn to serve themselves well, becoming strong and self-reliant before dedicating themselves to their cause. In the second position: This suggests that the youthful posture here may be less than beneficial, perhaps even irresponsible. In the fourth position: This knight can deliver his/her gifts through you. In the sixth position: At one extreme, you are going overboard with your emotions here. At another extreme, there is disappointment. In the seventh position: Thoughts may have become concerns which have become fears. In the eighth position: At one extreme, too much youth, inexperience, irresponsibility may mark your present situation. At another extreme, you may lack the youth, the energy, the investment that you need at this time. In the ninth position: Your heart may be involved with this knight, but rather not be. Or, the opposite, this can be the symbol of your heart’s sadness over this person. I know it’s a little late to respond, but depending upon the position of your card, the reversed knight of pentacles may be suggesting to release this person from your life, probably leaning towards the “giving them space” route. Cards are picky with specifics- asking about specific routes of action haven’t been answered well in my experience. What I would have done in your situation is focus on the person just generally while meditating and shuffling, leaving the actions up to the cards to dictate. This person may be impatient with themselves and seeking/have seeked your love and security as means of comfort; this doesn’t necessarily mean they are healthy for you, even if you can’t see that from where you’re at, again recommending to give this person space. Focus more on your goals and less on this person. Should your relationship continue, it’ll be at a time when you’ve both had enough space to work on yourselves. I hope this ads some clarity to the situation, even if it’s old. I asked if i should keep contact with someone by phone or give them some space? 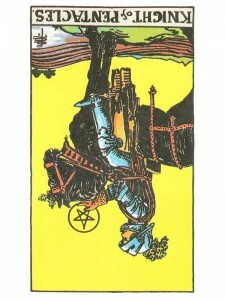 How does the reversed knight of pentacles answer the question?